Surrogate assisted meta-heuristic algorithms have received increasing attention over the past years due to the fact that many real-world optimization problems are computationally expensive. However, most existing surrogate assisted meta-heuristic algorithms are designed for small or medium scale problems. In this paper, a fitness approximation assisted competitive swarm optimizer is proposed for optimization of large scale expensive problems. Different from most surrogate assisted evolutionary algorithms that use a computational model for approximating the fitness, we estimate the fitness based on the positional relationship between individuals in the competitive swarm optimizer. 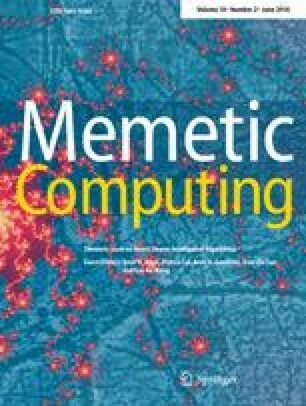 Empirical study on seven widely used benchmark problems with 100 and 500 decision variables show that the proposed fitness approximation assisted competitive swarm optimizer is able to achieve competitive performance on a limited computational budget. This work was supported in part by National Natural Science Foundation of China (Nos. 61403272 and 61590922), an EPSRC grant (No. EP/M017869/1), the Joint Research Fund for Overseas Chinese, Hong Kong and Macao Scholars of the National Natural Science Foundation of China (No. 61428302), and State Key Laboratory of Synthetical Automation for Process Industries, Northeastern University, China.